Carole writes, "We went to Thessalonica (Thessaloniki) to trace the apostle Paul's steps. We had hoped to find a tour guide to lead us by the hand...but that was not to be found. Thessaloniki is the second largest metropolitan city in the country after Athens. 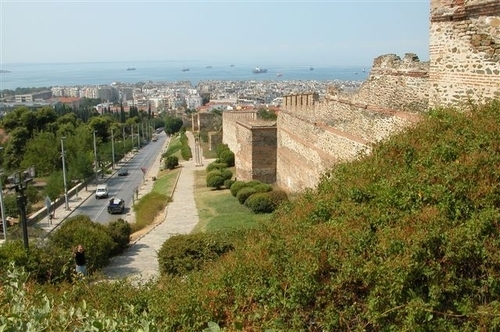 This photo shows the east Byzantine walls of Thessaloniki. At the top of the walls is a fortress (Heptapyrgio). The walls were built just after Thessaloniki's founding in 315 B.C. They originally formed a rectangle but the seafront walls were demolished during the last period of Turkish occupation. If you look really close you'll see Ken in his black t-shirt (lower level quadrant)."